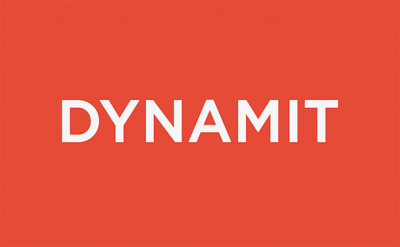 Dynamit is a partner who blends the power-to-execute of a software consultancy with the strategy and design of a digital agency. We invite you to expect more from your digital partner. We architect and deliver technology experiences that enable your Marketing + IT partners to drive business outcomes and create alignment, engagement, and excitement. We gain a deep understanding of your needs so that, together, we build today’s requirements in a way that empowers tomorrow’s iterations. Our purpose is to guide our clients through architecting exceptional experiences. Let's Build Together. Our Mission: Together with our clients, we build exceptional digital + software experiences that are right-sized for today and scalable for tomorrow. We commit to connecting personally, making and keeping promises, and guiding our partners as a part of their team. Learn more about how we can help you expect more from your next digital project on our website, or get in touch with us right now by sending us an email. The Dynamit Experience Blueprint blends strategic elements into a unique process that helps you visualize your possibilities and move your project forward – saving time, money and resources along the way. The Blueprint shows you what you can really expect from Dynamit as your digital + software partner – MORE. Founded in 2004 by Matt Dopkiss and Bobby Whitman, Dynamit sought to rethink how websites were built. Dyna=power M=Marketing IT=information technology. The name combined the power of digital/marketing with the expertise of software/IT. It's not either/or - it's both/and. This blend is at the essence of Dynamit's competence and character, critical to delivering on our promises to build together and excced expectations with exceptional experiences. An iconic brand like White Castle deserves a website that delivers more of what people crave. We’re thrilled to announce that our partner White Castle has launched its new and improved website! Headquartered in Columbus, Ohio, White Castle is home to the most influential burger of all time, the Original Slider®. White Castle’s business has continued to evolve over the past few years with an increased focus on grocery retail sales and restaurant delivery. White Castle’s website required more flexibility and reprioritization in order to keep up with a constantly changing industry and to properly highlight the things that matter most to White Castle’s customers and its business. In addition to improving the site’s flexibility, White Castle wanted all customers to have access to the website, adopting ADA (Americans with Disabilities Act) accessibility best practices to allow users with disabilities to navigate and explore the site more easily, as well as to be used with screen readers and other assistive technology more readily. In early 2018, White Castle decided it was time to rethink its web experience, choosing to partner with Dynamit, who they were already working with on a variety of digital marketing projects. A few of the key points for the new website were to implement a flexible CMS that gave White Castle more control, find new and creative ways to engage White Castle’s fans, and create a look and feel that authentically reflected the essence of White Castle. This took a partner who understands how to combine the power of digital marketing and software consulting and development. Working with White Castle’s team, Dynamit was able to create clarity around the problem and bring the best solution forward. Together, White Castle and Dynamit chose the dotCMS platform as the best fit for the project as it allows White Castle to operate more nimbly, adjusting content on-the-fly to reflect ever-changing offerings. Through dotCMS, White Castle now has more freedom and flexibility to choose what they promote and where it shows up throughout the site, with immediate examples being its focus on grocery and delivery. This gives White Castle even more flexibility for future iterations of the site. White Castle has always been a brand with passionate fans — a group affectionately known as Cravers. For Cravers new and old, the site incorporates a variety of ways to engage with the brand. The Crave is a new section of the site that allows users to tailor the content to their preferences, dialing up and down various types of info to explore more of what they love about White Castle. In addition, fans can explore Craver Nation — including recipes submitted by fans and learn about the boldest Cravers of all in the Cravers Hall of Fame. Last but not least, for those extra morsels of Craver flavor, look out for Rooks — a castle-inspired icon sprinkled throughout the site that gives you access to go deeper and learn just a little bit more about the brand. In addition to redesigning the website user experience, the new site redefines how the brand is presented digitally. Like most restaurant brands, White Castle will always rely heavily on product imagery, capturing all that the brand encompasses necessitated a new direction. This included a greater emphasis on the full experience of enjoying White Castle’s food, specifically nostalgia, creating a sense of memorable moments through a modern lens. To do this, Dynamit developed a photo style guide to guide photo shoots and utilize this feeling. Not only does the new website heavily showcase this imagery, but the site’s increased flexibility also empowers White Castle to adjust the imagery as needed. To see the new imagery in action, learn about White Castle’s delivery partners, or find a grocery store carrying White Castle products, visit https://www.whitecastle.com/. You may even learn what it is that inspires a fanbase as passionate as White Castle’s Cravers.